Do high tech and homesteading go hand in hand? Absolutely! When people think of homesteaders, they often envision people eschewing all modern conveniences, and living like they’re in the 19th Century. However, while simplifying your life is a key component of homesteading, that doesn’t mean you have to turn your back on technology. There’s no law saying you have to “rough it” and go without to be a homesteader. In fact, there are many high-tech tools and devices that you can put to good use on your homestead. 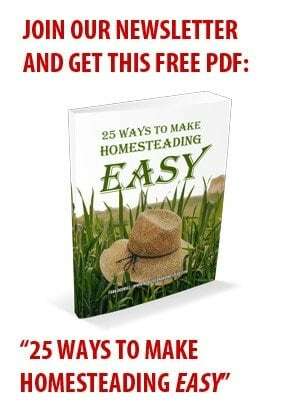 There are also many modern homesteading “hacks,” or neat tricks that can help you get the most out of your homestead, so you can live your life to the fullest. Many of these tools and tricks will save you money, too. 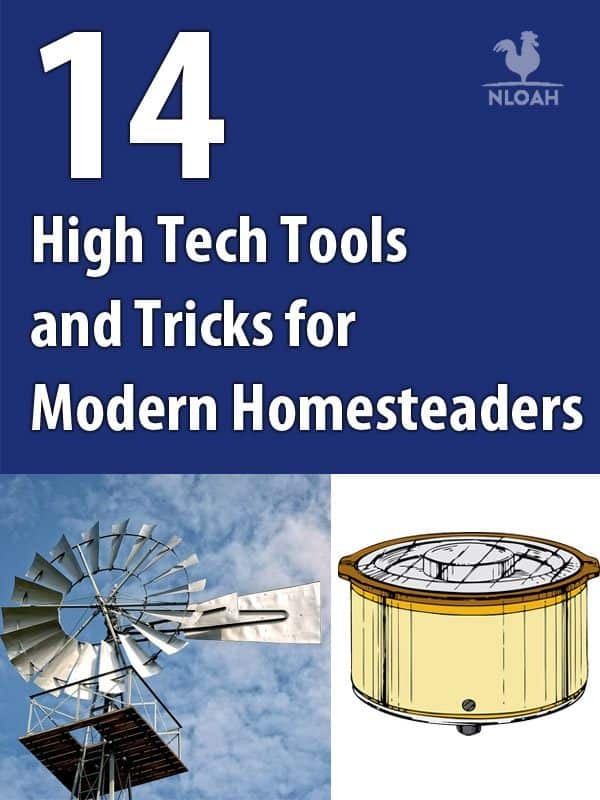 Let’s look at 14 high tech tools and tricks modern homesteaders can use to get the most out of their land, homes, and life. One of the best ways to put tech to work on your homestead is to go solar. The price of solar panels are cheaper than ever; in a few years, many analysts forecast that solar energy will actually be cheaper than fossil fuels, too. So maybe you should consider installing solar panels on your homestead. Even if you opt to stay connected to the grid, you can still make good use of solar power; you can install panels to light up your outbuildings, like a barn, or to power those freezers in your basement. While there may be an upfront cost to installing solar panels, doing so will say money on your utilities in the long run; there may be state and federal tax incentives to do so, too. Solar panels aren’t the only way to put the sun’s energy to good use on your homestead, however. If you purchase or build a solar oven, you can use the sun to cook your meals on sunny days. And if you’re designing your homestead right now, you can take advantage of the sun’s power without using any technology at all; just put passive solar design to work, and let the siting of your homestead – along with the positioning of windows and use of specialized building materials – make your new homestead much more energy efficient. If you want to truly take advantage of everything Mother Nature has to offer, you should also consider the benefits of wind. Depending on where you live, wind can be a very reliable source of energy to power your homestead (or at least parts of it). Wind turbines, or windmills, are great for generating electricity whenever the wind is blowing. Like solar panels, windmills and turbines are more affordable than they have ever been; windmills are also great DIY projects for the mechanically inclined, too. So check and see if your homestead is a good candidate for wind power; if it is, install a windmill, and start generating your own electricity. And if you decide not to go high tech with wind, no worries; you can still use those nice breezes to help you save a few bucks here and there. If you install a clothesline on your homestead, you can forget about your electric clothes dryer, and let your clothes air dry in the wind. Linens dried on a clothesline smell fresher than anything you’d pull out of a machine, and they are easier on your wallet, too; drying your clothes on a clothesline can save you over $120 each year just in electricity costs alone. So hang a rope between two trees, and start air drying your clothes! Water is especially important to homesteaders. Your crops and livestock need it to grow and thrive, after all. But are getting the most out of the water you have available? If not, there are some tools and hacks that can help you make the most of the water around you. Some lucky homesteaders can even use the water they have available to keep the lights on and save on their electric bills. Do you have access to running water, like a stream, creek, or small river? If so, you may be able to generate power with it. There are numerous micro hydroelectric generators that can let you harness the water around you, and turn it into energy. You can also build your own if you are mechanically inclined and want a real DIY challenge. Turning that creek that flows through your pasture into a reliable energy source is a great way for homesteaders to take advantage of the tech that’s available today. For homesteaders who are constantly trying to ensure they have enough water for their farms, there are also water hacks that can ensure your crops and animals are always well-hydrated. One of the best ways to optimize the water you have available is to harvest rainwater. Channeling all of the rainwater into large containers can take the pressure off your well, and let you make the most of water that would otherwise just get absorbed into the soil or turn into runoff. IBC containers, which are used to ship bulk liquids, are inexpensive and perfectly suited to a second life capturing rainwater. Make sure any IBC container you use to hold water never held toxic chemicals, however. And while we are talking about water . . .
Homesteaders are always searching for ways to be more productive. One way to put unused space to work for you – and raise fish and crops in the process – is to embrace aquaponics. Aquaponics combines raising plants hydroponically with aquaculture, or raising aquatic livestock of some sort. The aquatic livestock produce waste materials that the plants filter out as food, helping to purify the water for the livestock in the process. The continuous aquaponics cycle allows your crops and aquatic livestock to symbiotically benefit from one another, all the way to harvest time. There are many types of livestock ideally suited for aquaponics; tilapia fish, a common grocery staple, as well as crayfish, are common choices for marketable aquaponics systems. Tilapia in particular, since they are very hardy and are popular sellers at farmers markets, make great choices for a homestead aquaponics setup. Greens like lettuce often do well as the plants in these types of aquaponics systems, although savvy homesteaders often experiment with many different types of crops. While you can purchase these systems, aquaponics systems are a DIY mainstay on homesteads that adopt this innovative practice. Once you become confident with growing your own fruits and vegetables, maybe it is time to take your gardening skills to the next level. There are many innovative horticultural techniques which, if mastered, will let you get the most out of your garden each year. Grafting, the joining of two separate plants into one, is a perfect example of this. Many farmers and homesteaders will graft the branches of multiple apple varieties onto a single tree; each branch of the tree will then produce the type of apple from whence it came. Grafting can allow homesteaders with minimal space to maximize the varieties of fruit they produce. When it comes to gardening, buying plant stock for a homestead can be very expensive. So why don’t you just make your own? You can create new, viable plants, both softwood and hardwood, simply by taking cuttings from healthy plants. Many popular trees, shrubs, and perennial plants are easy to propagate from cuttings; in many cases you can rapidly create large quantities of healthy, valuable plants, then sell the new plant stock online or at farmers markets. Your smartphone is a life saver in your professional and personal lives. You use it to communicate with the home office while you’re on the road, and video chat with family and friends to make sure you stay connected to them. Are you fully leveraging your mobile devices on your homestead? If not, you are definitely missing out. Your mobile devices can keep you connected to your homestead, even if you are away; they can even let you exercise control on your homestead with the touch of a button. For example, you can install security cameras on your homestead, and access live camera feeds on your smartphone to keep an eye on things while you’re away. Additionally, you can install smart home controllers that will let you turn on and off equipment – lights, pumps, sprinklers – all with the touch of a button on your mobile device. If you’re thinking about a homestead, don’t fret if you don’t have any building skills; you can just have your home delivered right to your site! More and more homesteaders are making transforming shipping containers into affordable, compact homes, and living out their homestead dreams. In fact, there are many companies that refurbish these containers, and make them into the (tiny) home of your dreams. There is a great precedent for these sort of dwellings; U.S. service members deployed to Iraq and Afghanistan lived for months at a time in refurbished shipping containers, so you definitely can, too. If a shipping container isn’t your thing, there are other options if you want to get established on your homestead right away. Yurts are another great instant home as well. These round, tent like structures are easy to install, and can make for comfortable living. Many can be retrofitted with amenities like heat, electricity, and plumbing, too. So don’t let the cost of a new home ever keep you from pursuing your dreams as a homesteader. If you want to embrace technology, save money, and get in better shape all at the same time, consider purchasing an electric bicycle. Electric bicycles, or e-bikes, have electric motors that can kick in to give your manual peddling a boost, or to outright take over and power the bike altogether if you want to take a break and enjoy the ride. Many of the new e-bikes bikes have ranges of thirty to seventy miles, too, so they can really go the distance. An e-bike can save you thousands of dollars each year in gas and car insurance if you opt to replace your automobile with one. They are also easier to maintain and store than a car, and will help you stay in shape as you go about doing your weekly homestead errands. And if you’re using solar, wind, or micro-hydroelectric devices to keep your homestead up and running, you can power up your e-bike for free, too. When it comes to food preservation, most people choose to can select vegetables and fruits – often as jams, jellies, and pickles – and then freeze everything else. However, there are many other options to preserve your foods, and make a good harvest last all year long. If you take advantage of some different tech and devices, you can add diversity and flavor to your pantry, too. One way to diversify your food preservation efforts is with a dehydrator. These handy and affordable appliances will let you dry out fruits and meats so that you can keep them on hand for weeks or months at a time. Plus, many dehydrated foods are delicious. If you enjoy beef jerky, dried apple slices, or fruit leather, you should definitely purchase an inexpensive dehydrator sooner rather than later. Additionally, if you want have foods on hand that you cannot preserve through the boiling water canning process, you should consider getting a pressure canner. A pressure canner uses steam to heat packed canning jars to temperatures which kill harmful pathogens and render preserved foods safe. With a pressure canner, you’ll be able to preserve foods like meats and seafood so they can be stored at room temperature for up to one year. It may sound like science fiction, but drones and other robots are increasingly used to good effect in agriculture; they can make maintaining your home much easier, too. If your homestead is spread over a large area, an unmanned aerial vehicle (UAV), or drone, can help you manage it more efficiently. Drones are increasingly used on farms for tasks like monitoring valuable livestock, or inspecting distant farm structures; they can even be used to detect problems with planted crops early enough for you to take corrective action. Highly capable drones are fairly simple to use, and are becoming more affordable too; if you want to increase your capacity to manage a large homestead, you should consider purchasing one. If you’re willing to take the plunge with drones flying over your fields, how about unleashing one or two autonomous devices in your home? Cleaning robots continue to get more and more advanced and effective as time goes on; many of them can autonomously map the floors of your house and then work to keep them clean. It is often impossible to keep up with the dirt and dust we track into the home as we go back and forth from the barn to the field; a vacuuming robot might be just what you need to keep the floors presentable, and save you a little bit of time in the process. These robots are affordable, easy to use (they are autonomous! ), and definitely worth adding to your homestead if you always want someone on cleanup duty. If you are reading this article, chances are you already know what the Internet is. However, did you know what a tremendous resource the Internet is for homesteaders? Let’s count the ways. Having access to the Internet – whether in your home, at work, or at a local library – is the key to tremendous levels of free information that would have been jaw dropping just a generation ago. Are you interested in a step-by-step recipe for cranberry walnut conserve? It is only one Google search away! The free information available on the Internet can help you learn how to do new tasks, troubleshoot issues with livestock or equipment, or purchase something at the very best price. For many homesteaders, their access to the Internet yields more than just information or point-and-click shopping sessions. More and more homesteaders use the web to connect to like-minded individuals, share ideas, and build virtual communities and support groups. In fact, the existing of online homesteading communities like the Facebook Homesteading group and the subreddit on homesteading are part of the reason the homesteading lifestyle is so popular today. Other homesteaders also use their access to the Internet to monetize their homesteading experiences; that is, they document their experiences on blogs or YouTube Channels, and make money through as sales, merchandising, and other ways. 3D printing, sometimes referred to as additive manufacturing, is another technology that is becoming increasingly affordable; it is also something that could come in really handy on a homestead. With 3D printing, a user conceives a three dimensional object on a computer using some sort of design program, hits “print,” and a printer immediately fabricates the object. There are many types of 3D printers; some are used to make plastic parts, while others can be used to make metal objects or electronics components. Their price range can be pretty wide too, but they are more affordable now than ever before. A 3D printer could come in extremely handy on a homestead. You could print replacement part for damaged tractors, lawn mowers, or other machinery that have been discontinued and difficult to come by. A metal 3D printer could also be used to customize and fabricate everyday items, such as hinges, so that these unique items are available whenever the homesteader needs them. The ability to custom design and fabricate items could also allow homesteaders to design entirely new equipment that isn’t available anywhere else, too. Parting Thoughts: Use Tech to Your Advantage! High tech tools and hacks like the ones discussed here can help you get the most out of your homestead. They can save you time and money, and let you enjoy the homesteading lifestyle even more than you already do. And if you like these ideas, keep on searching and experimenting with technology as it becomes available; maybe some new tech can help make your homestead even better. 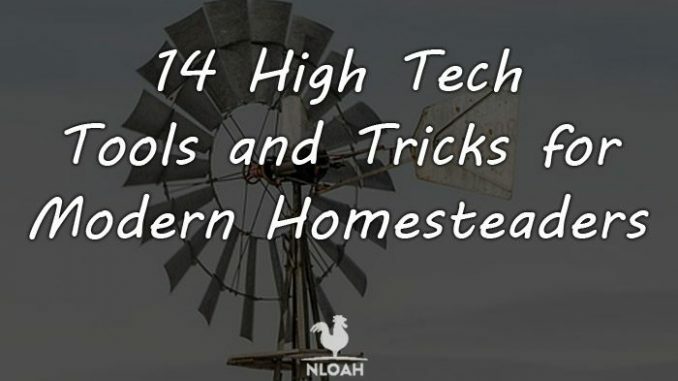 Why high tech tools and tricks do you use on your homestead? So I noticed that you brew your own beer. My husband has started that but we would like to take it to the next level, growing our ingredients ourselves. Do you grow your ingredients? Any suggestions on source materials to learn how to do it? We are in the foothills below the snow line in California. We have tall pine and oak trees so lots of shade. Is any of it possible? perfect list. some states will put you in jail for having a rain barrel. I don’t live in one of those! I might include: a welder, chain saw, table saw, band saw, drill press, planer and saw mill. But since you are talking high tech, maybe just a cnc.